Cake Contest Winner Dec. 2010! I made this cake for my sister-in-law's wedding in October 2010. They had asked me to make them a wedding cake, as I'm well-known in the family for my love of baking and have made many character cakes for birthdays, baby showers and other special occasions. They gave me the green light to be creative and dream up whatever I wanted, theme cakes included. Since they are both avid skiers and live in a ski chalet at the top of a ski hill in Ontario, Canada, AND I have many gingerbread houses under my belt, I decided to combine the two and just go with what I know. I asked my mom in law to send me photos of the chalet from all four sides and designed the gingerbread template from that. I baked the gingerbread, using crushed clear peppermint candies for the windows (melted in the oven the last few minutes of baking). Since we live in BC, I transported the gingerbread pieces, unassembled (making an extra set in case something went awry!) across the country and assembled it there. I made the cake using 14"round cake pans, baking cores and insulating baking strips (the aluminum/cloth bands designed to even out the temperature while baking). The top and bottom layers were pumpkin spice and the middle was chocolate. I used cream cheese icing, but added more icing sugar for a stiffer icing so that it would stand up to being transported in a car for a two hour drive. For the trees, I used both sugar cones and mini cones and spread green icing on the outside (a darker shade for bigger, "older" trees and lighter for smaller, "younger" trees), using the spatula to make the "branches". 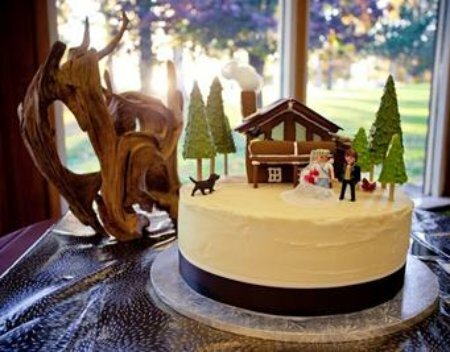 I used wooden dowels secured with royal icing for the tree trunks (I had used pretzel sticks for a "camping" cake I made my son but they absorb the moisture from the cake and topple the tree!). For the figurines, I used Playmobile, with the exception of the dog, which is a Schleich toy. The Ski Chalet Wedding Cake was very well received by my brother and sister in law and, thus, worth all the effort that went into it!